Having walked through the upper concourse of Highgate Underground station, we turned left, up a short stairway into a small parking area. 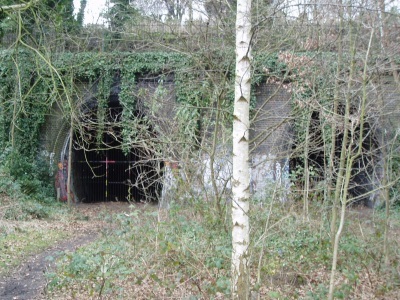 By looking over a wall, it was possible to see the southern end of the high level platform area along with the start of the second tunnels. Since the tracks ran through a short stretch of tunneling, we had to walk down some side streets to see where the tunnels ended and where our walk would resume along the tracks. Notice how tall the tunnels are - a much more eliptical shape than we'd expect to see in tunnels today. This is because these tunnels were built with steam locomotives in mind and the extra headroom allowed the steam to keep clear of the train. 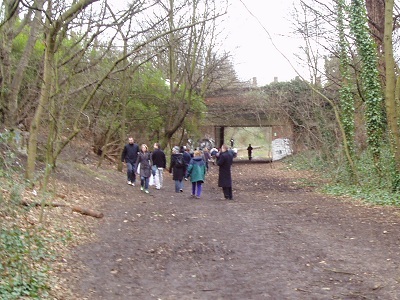 The walk would now follow the track-bed all the way to where the original railway met the mainline tracks at Finsbury Park. Over this part of the walk, it didn't take too much imagination to picture the tracks running down where the footpath now led. 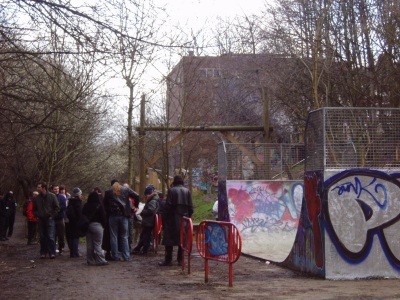 This was the southern part of the Parkland Walk and as with the Northern stretch, this is now maintainted by Harringay council. Carrying on down the walkway, we crossed several bridges. 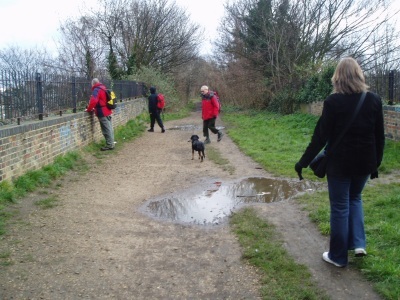 The walk was relatively straight and the group spread out as some walked quickly down the front, whereas others walked at a more leisurely pace, taking in the sights. 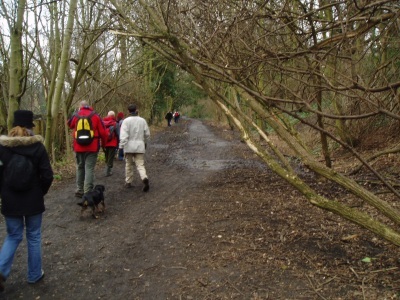 The path at times got a little muddy causing the group to string out into single file following less muddy routes. 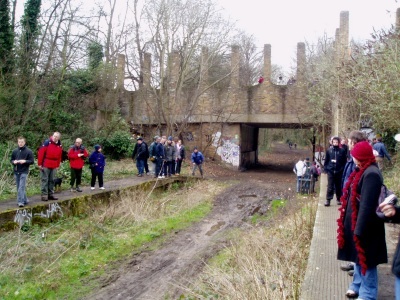 Immediately before arriving at the location that Crouch End station used to occupy, many in the group stopped to observe a rather strange formation. 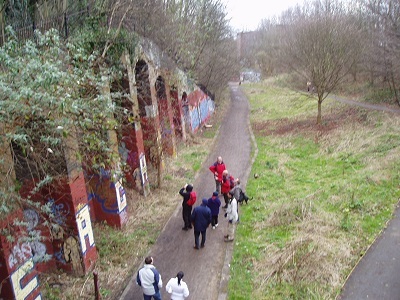 At this location, a trackside building used to stand. Over the years however, nature has taken its course and the building has almost totally been destroyed. 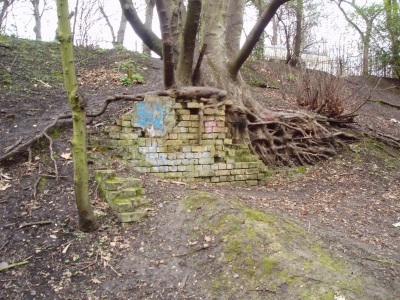 What was left however had a tree growing in it, with the roots passing directly through holes in the bricked wall. 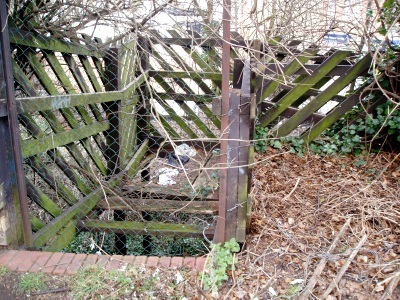 Immediately after this small structure, going under a bridge led to Crouch End station platforms. 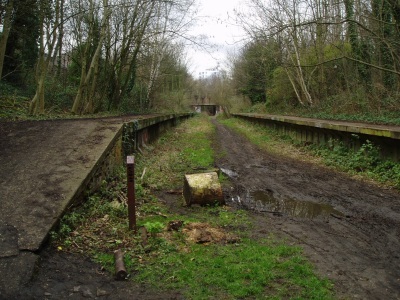 Along with the Highgate plarforms, these are the only surviving platforms from the footpath's original existence as a railway. The Eastern staircase leading to the street above still survives, but the station building, which would have originally spanned over the railway where the bridge is today has since been demolished. This may explain the peculiar pillars on the bridge. We stayed here for some time so that we had time to investigate and also for the rest of the group to catch up. 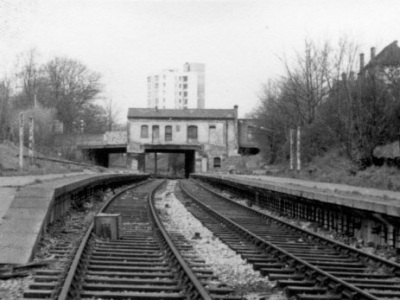 The next two photographs show the difference between Crouch End's platforms in 1971 and today. Notice that although the both lines are still there, one is quite obviously unused as not only is there a box on the track, but you can see in the distance a trestle beam has been placed right in the track's way to support the weakened bridge prior to the station building being demolished and the bridge strengthened. The walk then continued down towards a children's play area, but before reaching there, a strange sculpture was observed in one of the archways of the wall that lined the path. 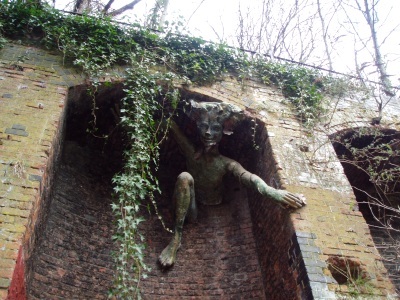 There has been much speculation about the nature of this sculputre - some suggested that it was a "Green Man". However, Paul Browne contacted me recently pointing out that it is the work of artist Marilyn Collins and the work is called The Spriggan. This pdf document, taken from The Archer, a local news letter for East Finchley talks a bit more about the scupture. 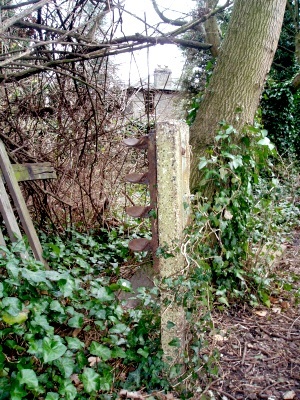 A badly decaying sign above the footpath told us that the next stretch had been developed as a community centre. 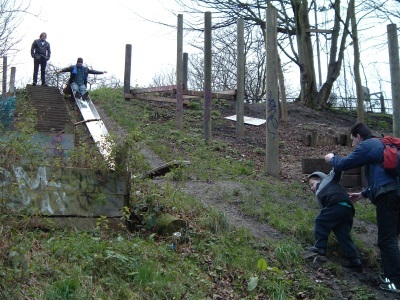 Externally, there was a children's play area which included slides and a skate boarding ramp. The building itself was actually originally built to house a sub-station for the Underground conversion - but unlike the one at Muswell Hill, which was demolished, this one was re-purposed as the community centre. A little further on, we passed under a bridge. 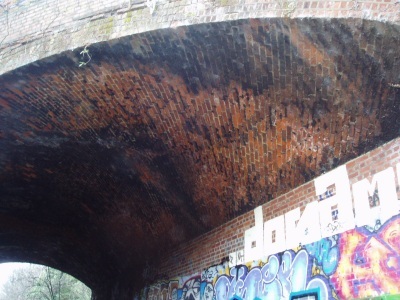 Looking at its roof showed that even after over 30 years of disuse, there was still soot there from the age of steam. Our next stopping point was the original location for Stroud Green station. To the uneducated eye, it would have been easy to walk straight past this location (and without my helpers I probably would have!). The station's platforms would have run across the bridge seen in the picture above. 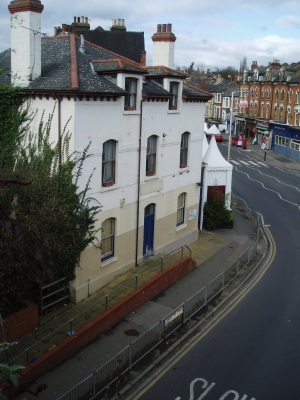 Looking over the bridge's parapet, the station house could be seen, now a private residence. 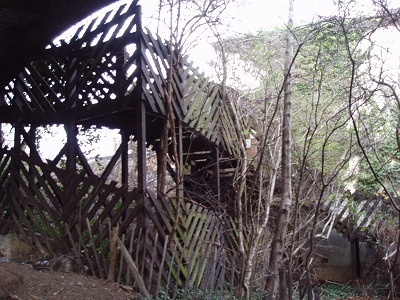 On inspecting under the bridge, I was amazed to discover that there was a rickety old wooden staircase was still in place! 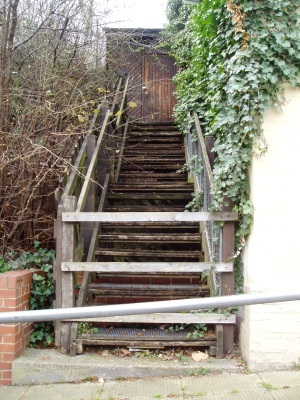 The staircase by now was quite derelict with boards steps missing and where they were present, they looked very rotten. My first hope was that this staircase dated back to the time when there was a station platform at this location that would have connected the street with the station above. I've since discovered however that the staircase dates back to the 1980s when the station building was in use by the local community and a link to the footpath above was desirable. Sadly the staircase quickly rotted and is now completely without hope of repair. (grateful thanks to local resident Howard Medwell for this information). 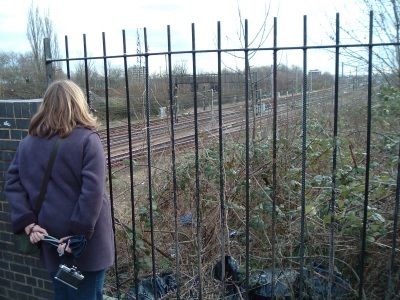 After inspecting Stroud Green's location, the group then continued down the Parkland Walk until the straight course of the path we had been following abruptly ended with a metal fence, through which could be seen the mainline tracks and Finsbury Park station in the distance. 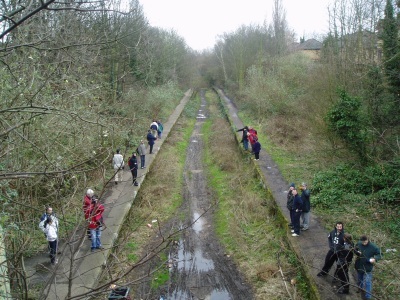 Here, the line originaly crossed the mainline tracks over a bridge, then looped down and joined the mainline tracks near Finsbury Park station. This was effectively the end of our walk, since very little of the line's course can now be traced on the other side of the tracks. It was over 3 hours after we'd started at Alexandra Palace, but everyone who has contacted me said that the walk was enjoyable! I'd like to thank all who came for making the walk the success that it was. Extra special thanks go to Brad and Yemi for providing detailed local knowledge that I'd otherwise have missed. Thanks also to Steve for being "second camera" on the walk! Backwards to part 2 - Highgate High Level Platforms. Station pictures taken April 7th 2001.Crouch End 1970 platform photograph © 1970,2002 Peter Wright and is used with permission. All material on this page is © 2001,2005 Hywel Williams unless otherwise noted. Pictures Taken by Steve are noted as such when you hover over the images.